There are two types of functions aggregation (AVG, COUNT, SUM, etc.) and ranking functions (Rank, Row_number, etc.) that can be used in window functions. 1. When do I use a Window Function? There are many useful cases. Window functions can be leveraged so summarize information at a different level. For example, the below query without a window function will group the amount column by user_id and platform and give use summarized results. 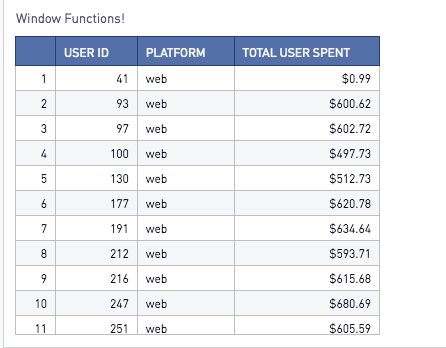 If you wanted to see the individual rows of user ids, platform and price but also see the total spend by users you could use a window function! 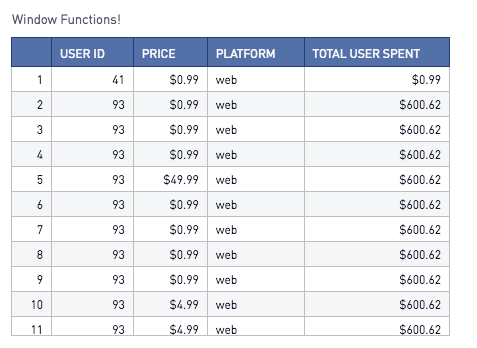 The query below will give you the detailed results of the User Id, individual price, platform and the total spend by user. 2. How do I set up a Window Function? 3. What functions are used in Window Functions? The functions below can be used in window functions. Note that the available functions and syntax maybe different between databases. Window functions are available in PostgreSQL, SQL Server, Redshift, and Oracle (and calls them "Analytic Functions" ). More examples on using the window functions check out this amazing blog post. Using window functions with date series check out this great blog post.